"A Keyblade that makes it easier to land critical hits." Meet Kairi in Radiant Garden. Destiny's Embrace is the default form of Kairi's Keyblade and a Keychain for Aqua's and Riku's Keyblades that is introduced in Kingdom Hearts II. When Kairi is still a child living in the Radiant Garden, she is saved from a swarm of Unversed by Aqua. Kairi gives the Keyblade Master some flowers as thanks, rewarding her with the Keychain for the Destiny's Embrace. Eleven years later at The World That Never Was, Riku hands a Keyblade equipped with another copy of this Keychain to Kairi so that she can help fend off a swarm of Heartless attacking Sora. Like Sora's Keyblade, this Keyblade is from the Realm of Light. When Sora is about to face Xemnas within the dream-version of The World That Never Was, he explains that the connected hearts of his friends are his power, and an image of Kairi wielding the Destiny's Embrace appears alongside all of his other friends. Kairi wields Destiny's Embrace to fend of the army of Heartless, Nobodies, and Unversed with the other Guardians of Light in the Keyblade Graveyard, and during the battle against Saïx and Xion. 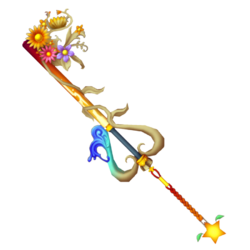 The Keyblade is round and curvaceous to the point of appearing harmless. One side of the hilt is formed in the shape of a breaking ocean wave, while the other is formed into a beige vine of sand that wraps around the shaft, which is colored to resemble a sunset. 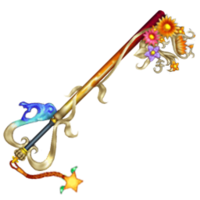 The vine connects to a bouquet of colorful flowers, which form the teeth of the Keyblade and entwine to outline a heart. A red silken keychain connects the hilt to the paopu fruit token, a recurring symbol of the bond between Sora and Kairi. Kairi's version of the Destiny's Embrace is slightly shorter than Aqua's. ↑ Director's Secret Report XIII, p. 28; Tetsuya Nomura: "That Keyblades are Light and Dark is not to say that there is one per side, and there exist as many of them as there are hearts of those who possess the capability. At the current stage, in regards to the requirements for possession, the only requirement that has become obvious is for "those whose hearts are strong", but there are also other requirements that have not yet been made clear, and we plan to reveal them at another opportunity. In nature, Riku's "Way to the Dawn" and the Keyblade that Kairi holds have become objects of the same nature as the Keyblade that Sora holds. However, there is no full explanation for the "Soul Eater" being generated as an intermediary [for the Way to the Dawn], or [the Keyblade that Kairi possesses] being handed over to Kairi from Riku, and when it's not close to the normal obtainment procedure, I think it's okay to feel that there's something more than meets the eye." This page was last edited on 22 April 2019, at 17:03.